9210 front (dial side) view. 9210 back view. Although this watch is a derivative of the Esa 9162, its uniqueness justifies looking at it more closely. The 9210 is the only tuning fork chronograph ever made. 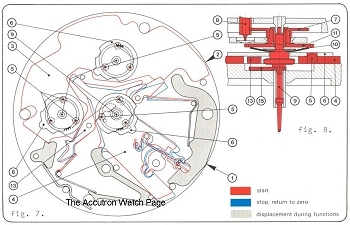 The picture above is the movement in its Omega Speedsonic form, some of which were supplied as certified chronometers. It was also used in Longines Ultronic and Certina chronographs and probably others as well. 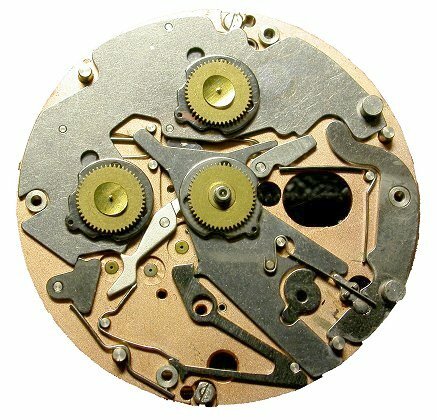 The chronograph mechanism is in modular form (refer to the Esa 9162 and 9164), and mounts on the dial side of the movement. Being of a Vertical Clutch design, it doesn't suffer from the inaccurate start/stop problems of standard sliding-clutch chronographs, It contains the gear train for the chrono mechanism, the chrono mechanism itself, and a train for driving the hands and date mechanism. Also, it has the day and date functions built into it, as well as the time and chrono functions. 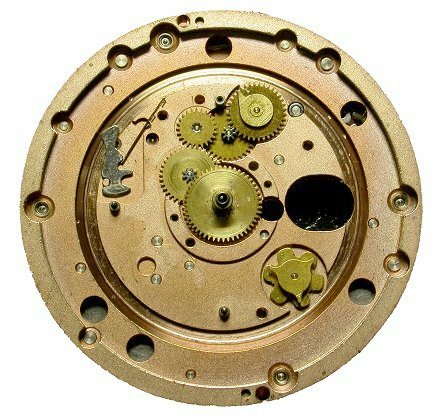 The Chronograph trains and constant seconds are driven by the Intermediate Wheel, which passes through the pillar plate and has its upper bearing in the chrono module. 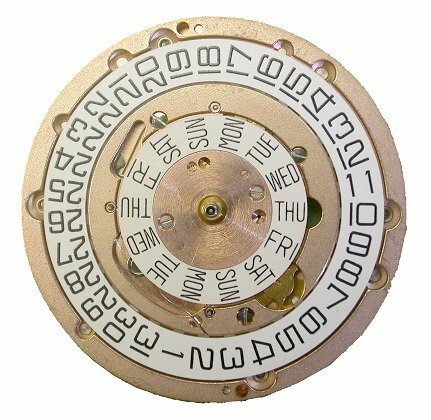 The time and date trains are driven by the Friction Wheel, which also passes through the pillar plate and has its upper bearing in the chrono module. See drawings below. 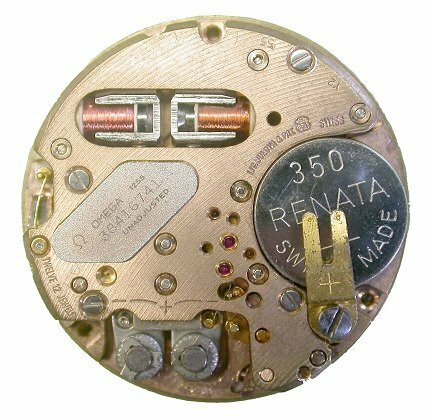 The functional specifications for the actual movement are the same as for the Esa 9162. 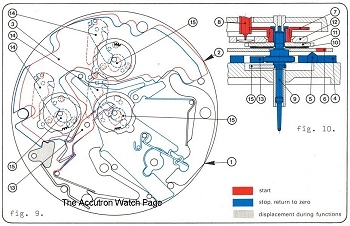 It is a complex watch in its construction and operation. Definitely one only for the experienced repairman to work on. 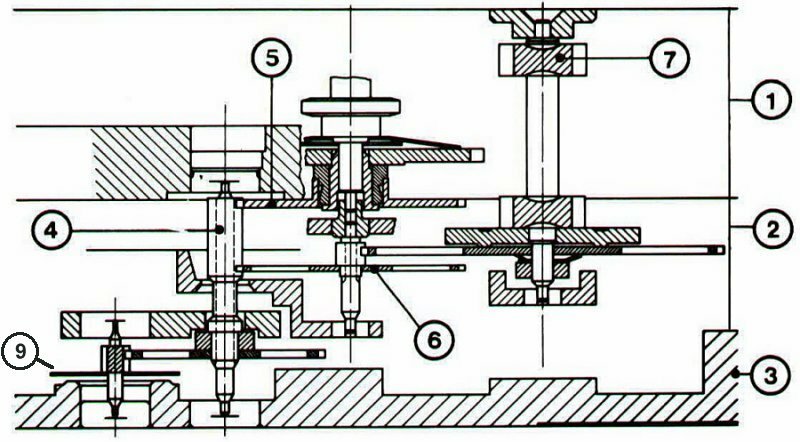 The most complex module is the chronograph section. 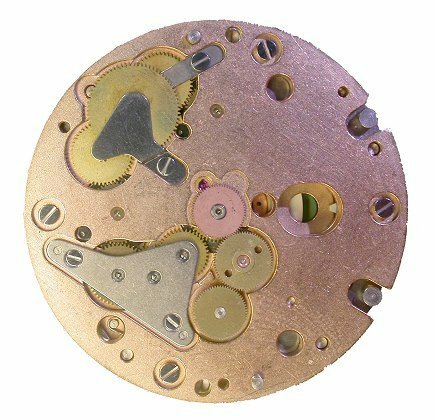 Esa had the chronograph modules made by Dubois-Depraz, who were specialists in designing compact chronograph mechanisms. Some people have said that the 9210 is just a 9162 with a chrono module slapped on top of it. Well, its sort of true, but the conversion is very cleverly done and quite complex. The pics below show the difference in the mechanism modules. One of the amazing features of the chronograph module is how thin they made it. Remember, this is 1972 we are talking about. It is only 3.15mm thick (or a tad over 1/8 inch), bringing the total movement thickness to only 7.95mm (0.298 inches). Here is a top and bottom view of the module. 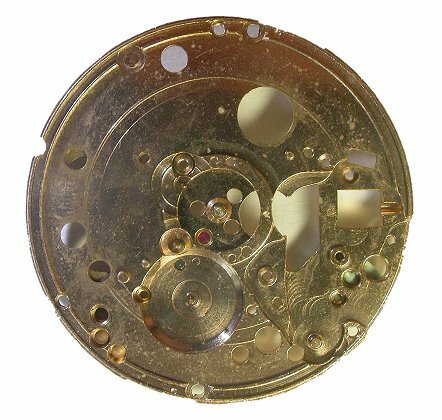 And if you think there are lots of gears in the back of the chrono module, there are just about as many on the dial side. In total, there are 19 gears in the chrono module, more than in most watches complete! One of the clever tricks was to get the continuos seconds and the time/date train independant of the function of the chronograph. 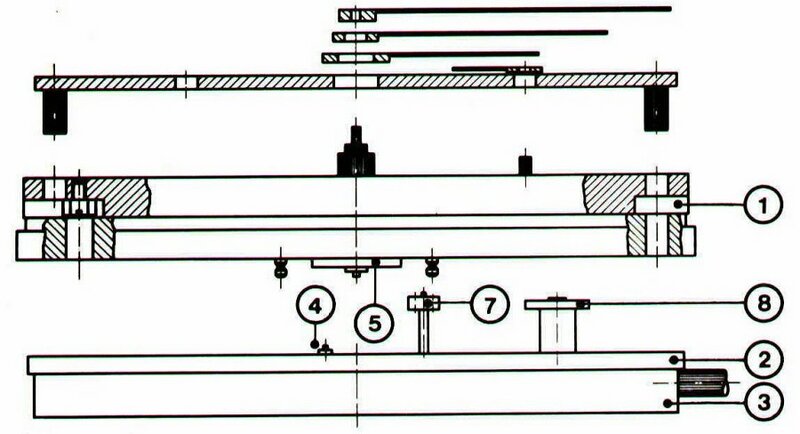 Also, since a tuning fork mechansim is designed for a more-or-less constant load, the chronograph was required to operate under constant load conditions. Hence when the chrono is functioning, the minute and hour hands move smoothly, like the small seconds and Chronograph hand. Omega extend this argument to the calendar, and say that is the reason why and the day and date changes smoothly. Actually, they simply could not have any "jumping" type date mechanisms in it, as they simply did not have the room to include one. Since the advent of chronograph modules like these, they have become quite common, being mounted on Eta 2892 series movements for example. 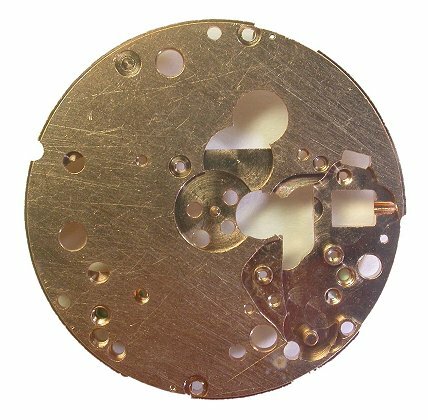 This module on the 9210 was designed in the days when it was expected that all parts of a watch could be repaired, part by part. 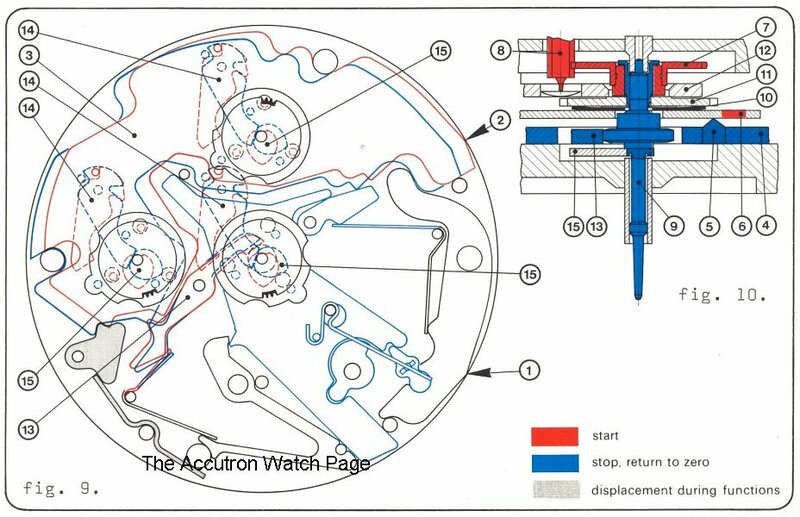 But with the advent of CAD systems for design, CNC Machinery and Robotics for manufacture very significantly dropping the cost of production, some chrono modules are not servicable at all, and have to be replaced with a new unit, For example the Eta 2894-1, where the replacement cost at wholesale is about 1/3 the cost of the watch, and at customer point is about 1/2 the cost of the watch. It makes one wonder who is getting the benefit of all this computer design and automation. 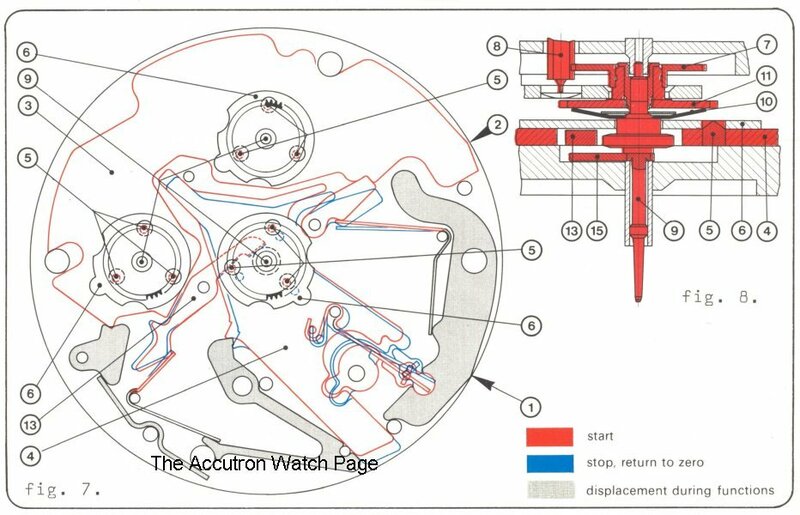 So to me, this adds value to movements like the 9210, being designed and built to standards which we rarely see today. OK, rant over...thanks for listening!